Kpenu is an isolated community in the Volta Region of Ghana. Like 83% of rural communities in Ghana, Kpenu is not connected to the national electricity grid, and is unlikely to be connected before 2020 due to high costs. Communities that do not have access to electricity fall quickly behind those that do, as power provides clear health, education, and economic benefits. This past year, on a World Bank funded pilot project in Ghana, EnterpriseWorks/VITA (EWV) trained a group of local technicians in design, construction, installation, and operation of wind energy generation equipment to provide electricity to 10 selected far-off communities such as Kpenu. These wind turbines, for the most part constructed from locally available materials, were produced and installed for half the price of the existing cheapest energy alternative. The impact of this project on Kpenu is significant. EWV believes that countless business innovations are possible with electricity provided by wind generators, and will no doubt promote economic development in Kpenu. Local manufacture of the equipment provides an additional source of revenue for the trained technicians. Additionally, the school children now have access to the President’s Special Initiative on Distance Education, aimed at providing quality education services to remote areas through videotapes. School children can also study and read in the evening thanks to energy saving lights. Teachers are able to purchase and recharge their mobile phones to increase their connectivity. A Kpenu community center has been built where internet-ready computers will be provided shortly by the local District Assembly, and where the entire community gets together after sunset to watch the day’s news on the television’s national network. 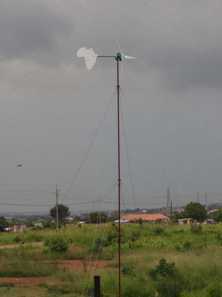 Despite their remote location in Ghana, residents of Kpenu now feel they are connected to the rest of the world.